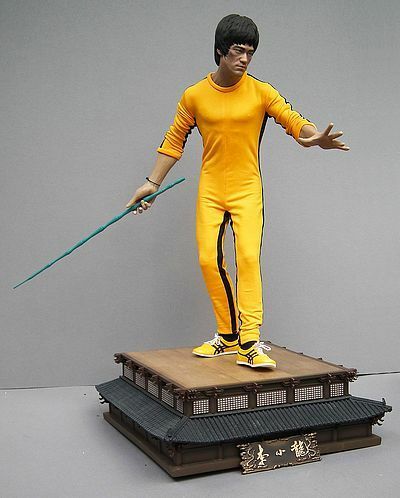 If you are a Bruce Lee fan the last few years will have spoilt you for with the array of different products available. And though many different artists have been involved in bringing us different interpretations at many different scales, the one name that remains synonymous with the legendary martial artist is of course Arnie Kim. Where ever he goes the license seems almost sure to follow. Initially he became renowned for his custom made, low edition sized personal projects, where so few were made available to collectors that the prices had to be kept high to merit their production. This of course enabled Kim to finance his future work, but also made them highly sought after, and elevated them to the status from mere collectables to that of art pieces. 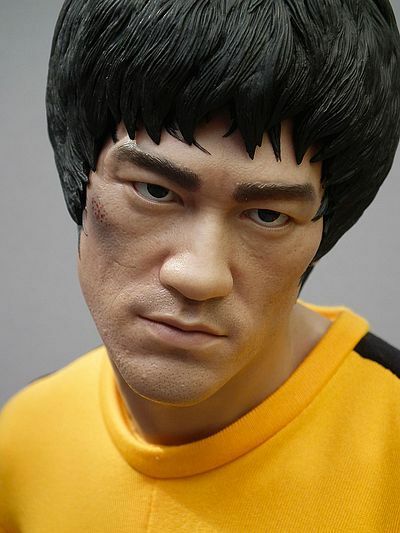 Since then his work was brought to the masses at more affordable levels by the Hong Kong based companies of Enterbay and then subsequently Hot Toys. In the interim he has moved to the new company Blitzway, where his first release was the stunning 1/6th of Al Pacino as Carlito ‘Charlie’ Brigante from Carlitos Way. A pretty amazing figure that for many was the standout release of 2013 (which considering the high profile competition was pretty remarkable). However, now he has returned to his most famous subject, but at an all-new scale and format. With that impressive size does come some truly outstanding detail, and that is evident in the stunning portrait, that has to be one of, if not the strongest commercially available portrait of Lee to date. So, lets imagine you are already the proud owner of a good few 1/6th interpretations, and maybe even the cool � scale statue, or maybe even the fully articulated � scale figure from last year… do you need another… lets see if I can give you a little steerage? This packaging is best thought of as utilitarian and functional, and when you are dealing with a statue of this scale, that seems pretty fair to me. 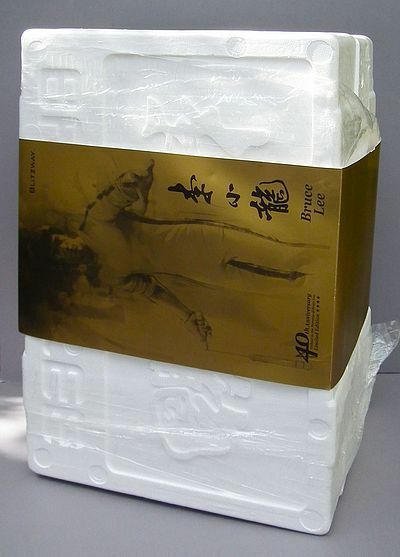 Mine arrived in an oversized brown freight-shipping box, within this was large white Styrofoam case, supported at all eight corners by Styrofoam corner protectors. Once this pulled out we are met with a typographic and illustrative design modelled within its surface (as has been utilised by other companies for their � scale figures, and indeed by Hot Toys on the 1/6th Terminator: Salvation line). It is held shut by broad tape and a printed card sleeve. Once the sleeve is removed and you have cut the tape, the box comes apart into three sections. The top holds the figure, the arms and his accessories whilst the bottom holds the ornate heavy base. So, we have a solid and functional piece of packaging that has been well thought through. It does the job of getting the contents to you unharmed very well, but its sheer scale makes it pretty unwieldy, and the design, whilst functional is not as exciting or aesthetically pleasing as the earlier cool boxes Blitzway did for their (admittedly smaller) Scarface or Carlito figures. 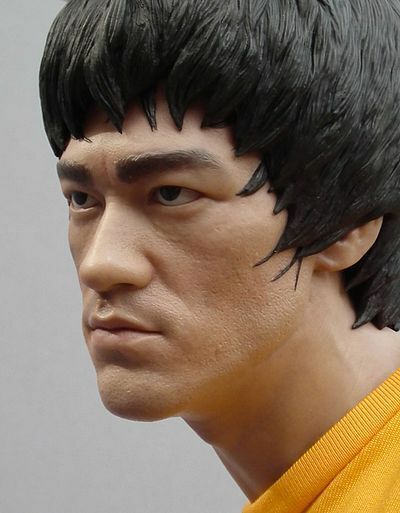 Up until now I think my favourite Bruce Lee portrait was the Arnie Kim vs Enterbay � scale statue (reviewed here- http://www.mwctoys.com/REVIEW_100610b.htm), it captured near perfectly not only his face, but also his hyper fit, lean and wiry physique. 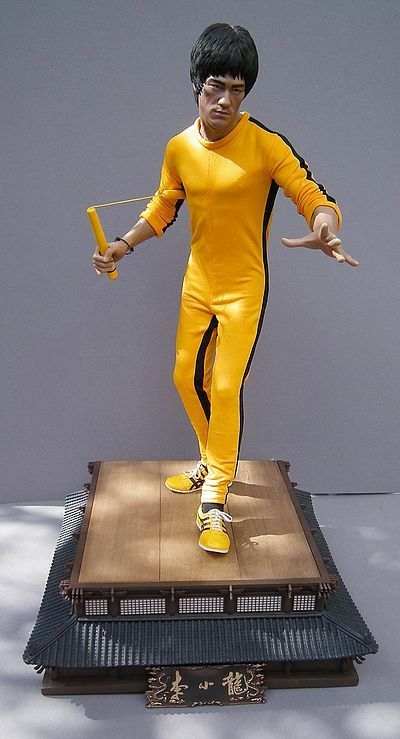 Admittedly there is not as much flesh on show this time, as he wears the classic yellow and black, Game of Death jumpsuit, but the work on the face, hair, arms and indeed trainers is just sublime. The face shows a focussed expression, and incorporates a graze on the right cheek, but even though the expression is focussed, it is also ‘neutral’ enough to show the actor just as we remember him. Recently we have had some more extreme facial looks in ‘mid fight’ expressions, and I have to admit I have really enjoyed getting these to add to the overall collection (variety is the spice of life), but I am also glad they went for a portrait here that is instantly recognisable as the great man. The hair shows the usual high quality, and the bigger scale allows for some deep crisp detailing, and more definition in the sheer amount of strands that can be rendered. It is constructed as a separate piece that mounts perfectly to the top of the head. 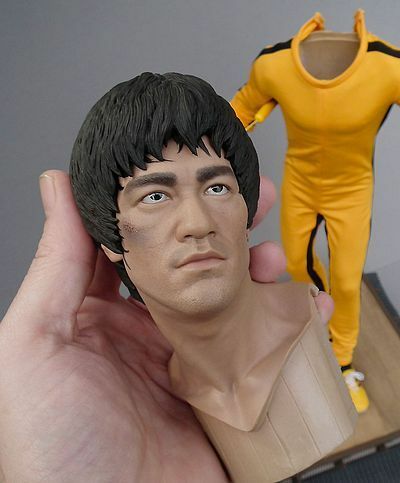 Both of these sections are made of vinyl, and the head is removable from the shoulders by means of a perfectly aligned slot, invisible when dressed. His hands and arms are cast in Polystone, and the sculpting is masterfully carried out, all three attach by means of concealed magnets. You need to push the sleeves of the suit up and they simply slot into place. I have to admit the magnets on my lowered right arm weren’t as strong as I would have liked, but do hold the arm in place just about OK. Luckily for me I prefer the pose with the nunchaku under the arm anyway, and the arm for this pose has a far stronger connection. Of course yours might not have this issue anyway. Both of the right arms come with the distinctive elephant hair bracelets already in place, and it does warn you not to move these around too much, as their metal wire construction could potentially damage the painted surface. 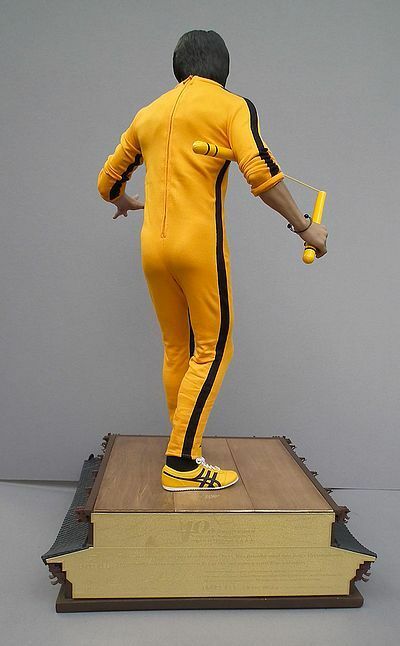 The head sculpt is undeniably the most important thing to get right here, but the iconic bright yellow Asics, Onitsuka Tiger trainers (though some seem to believe they might have been adapted Adidas) come in at a close second, and the attention to detail here is pretty astounding, to the point they almost become my favourite part. They are a solid sculpted piece with the peg that supports it to the base protruding from the bottom of the sole on the right foot. The sculpt here is enhanced by a beautifully crisp paint app and real tiny scaled laces are threaded through the eyelets to complete the look. 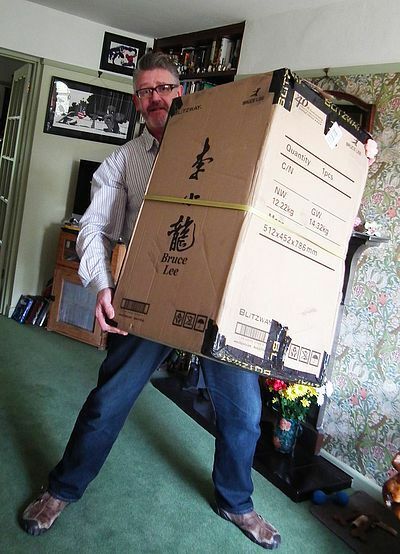 He also comes with an ornate base, modelled to look like the pagoda temple in the movie, and it is quite frankly huge! However I shall cover it in more detail for the accessories section! I’ve said it before and by Darwin I will say it many more times before I shuffle off this mortal coil, why do people accept the paint apps they do on statues… I guess because up until now they have had to! I know that the production method is a thoroughly different process from 1/6th, and ultimately we are talking about a thoroughly different product and often material, but on my travels I have seen some hugely impressive sculpts on statues that would have benefitted from a simple all over bronze effect, rather than the sloppy, ill advised excuse for a paint app that they receive. One of the criticisms often levelled by statue collectors against the ranks of 1/6th aficionados is that they collect a more ‘adult’ and ‘superior’ product, whilst onesixers collect ‘dolls’… firstly, you are wrong, we are all geeks collecting over priced toys, the fact that it is articulated or static matters not one iota! What should matter to us all is the quality and finish! And here, we have a sterling job! The flesh tones on the face are just masterfully rendered, with warm convincing tones that capture his particular colouring beautifully. There is also some well executed bruising and grazing to the face and expertly applied work on the eyebrows. 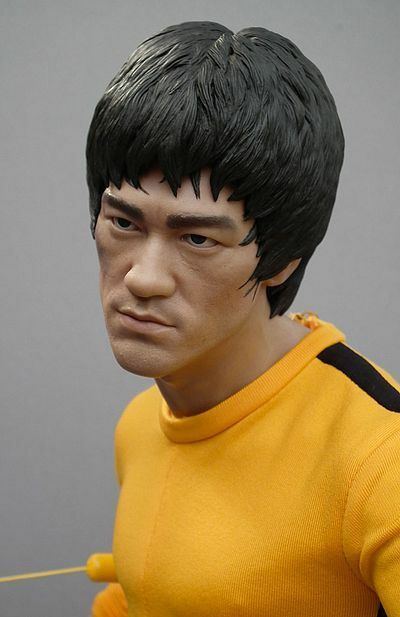 There are also a few stray hairs tricked in around the hair line where the sculpted hair meets the head, offering another layer of depth and realism to the transition point. The eyes are crisply rendered and clean, adding just the right level of glossiness to look real and catch the light well, and the edges are blended subtly to make the whole thing look very convincing. The arms are constructed of Polystone, and have what Blitzway call, and I quote… “a new ‘life like’ finish to give the statue unparalleled levels of realism” Now I don’t know what the trick is here, but they do have a beautiful semi-opaque translucent quality that catches the light very convincingly, with expertly applied colour washes to bring the effect to life. In short, the whole thing is pretty outstanding! Of course there is always room for improvement, and here I feel the hair could do with just a touch of attention. In the past, glossy Asian hair has just been routinely handled in a well sculpted, but ultimately flat coloured affair, that lets the quality of the sculpt do all the work against the sculpting in the vinyl. And to be fair it works pretty well here, but the extra scale does make one look just a little more closely, and it feels like a little extra colour might have let the sculpt sing even more. But even taking thay into account, this is a truly stunning paint app, and it would be remiss to offer anything but a full score… outstanding! This is not an action figure, so we don’t get a host of things to interact with, however what we do get is fair selection to capture a small handful of display options. I am counting the left arm with splayed fingers and the lowered right arm for gripping the bamboo pole and nunchaku as the basic items. Yes they do come packed separately, but lets face it you can’t count them as accessories, as he can’t come without arms, no sir, that just be plain wrong! 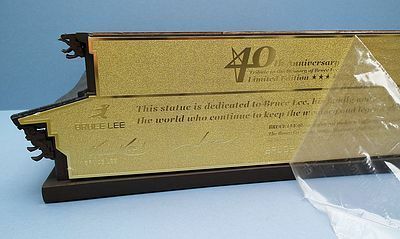 There was also an alternate super rare ltd edition of 200 with a gold base, which has long sold out from brucelee.com for $699 you can see in this video here- https://www.youtube.com/watch?v=NLBofqvQvtc that gives you a glimpse of its shiny golden wonder! The arms all attach by means of slotting onto pegs that have concealed magnets to hold them in place. This is a pretty nifty idea and on the whole works well. I did find that the magnet on my right lowered arm was a little weaker than all the others, but it still managed its task efficiently. 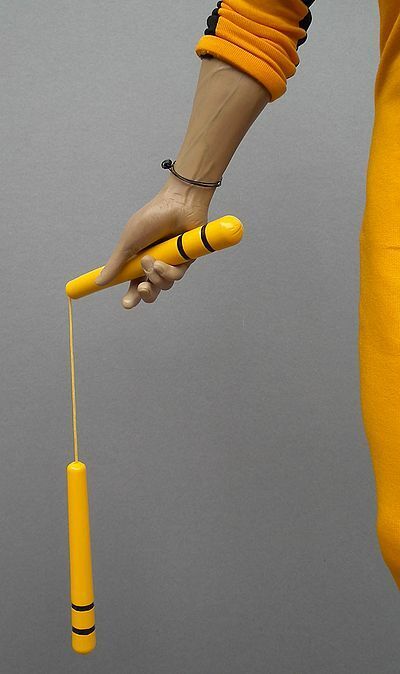 It did make me think that its probably worth using a small ball of Blu-Tack tucked up within the peg if I was going to use that arm for any long term displays, just to add some extra grip. Of course this may be an isolated occurrence on mine, but I just warn you so as to take care when swapping over. 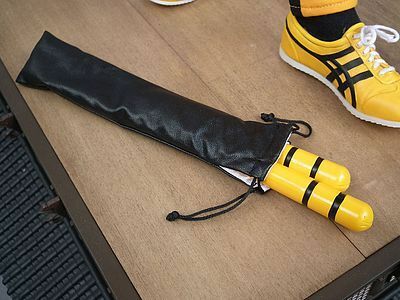 The nunchaku come in a drawstring topped black carry case, handy for storage and leaving at his feet should you choose the bamboo holding option. The weapon within is a great scaled facsimile of movie prop, and comes with a magnet concealed in one handle so it grips the under arm position when offered up, and the other handle comes apart by pulling the rounded base part away from the handle, this makes placing it in the hand an absolute doddle. The bamboo cane also comes in two sections that can be pushed together, and like the nunchaku it replicates its screen seen counterpart near perfectly. The nameplate included is a gold and brown antiqed finish, if you had ordered direct from Blitzway before a pre-set date it was possible for this to come personalised on the reverse with your name engraved, I should say I sadly left it too late, however I actually quite like the fact that it is left more anonymous, and even though I have zero intentions of selling this on, I like to leave my collection unencumbered by my personalised moniker. Lastly we have the base, and this thing is a beast, and by that I mean huge and heavy. It is intricately sculpted and tooled to look like the pagoda featured as the main location for the prolonged confrontation in the movie. The meticulous attention to detail here on the roof tiles, windows and protuberances are all finely crafted, and add another layer of richness to the statue when displayed. 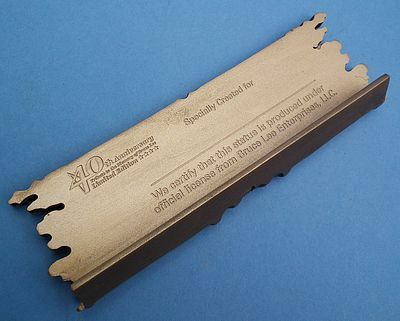 The reverse of the base is engraved with what in effect becomes your built in certificate of authenticity. Informing us of details about the fact this was created to celebrate and remember the 50th Anniversary of Lee’s sad and untimely demise. So a solid selection, and one that makes for a great display, with a few swap out options for good measure! I guess an alternate head sculpt and even a dirtied up jump suit with the infamous footprint might have been cool. However, I think the fact that they have managed to bring this in at $599 makes the selection seem pretty fair, and I’d rather have what we get than it be more costly, with some extras I might never use! Although this is a statue, it is obviously apparent that this is utilising multiple different materials to achieve its convincing levels of realism. 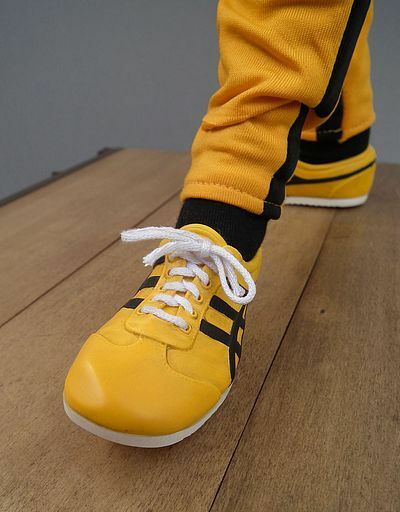 Part of this is down to the finely tailored and ‘oh so iconic’ bright yellow jump suit! The fabrics have been well sourced to mimic what we saw in the movie, and at such a weight and weave that they hang just right for the scale. The beauty of this statue is that the outfit is perfectly fitted to cover any points were the mixed media joints are hidden, and of course it does the job well. I know that Blitzway have a number of other exciting IP’s in the bag, so it will be interesting to see how the more clothed and indeed semi-naked licences fair using this mixed media approach. On mine all the seams and hems were finished well, with no loose threads or sloppy divisions. The back of the outfit has a concealed zip that runs smoothly, though to be honest its only needed if you wish to remove the head and neck for closer inspection. So, to sum up, this is just about as good as it gets for what is admittedly a relatively straightforward outfit to get right… however, that doesn’t diminish the fact that they did get it right! You can’t play with this, it is not a toy and therefore any fun derived is purely through ownership and display. 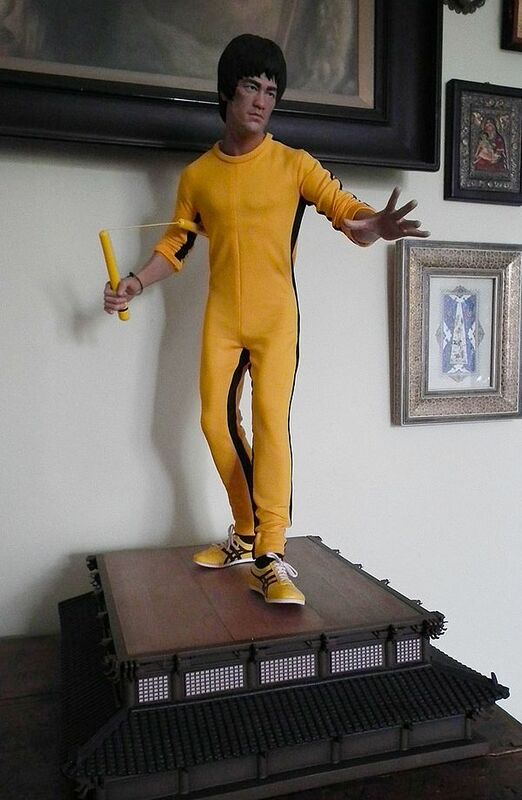 However, for any dedicated Bruce Lee fan, hell, even for the casual ones who just want to represent him in their home cinema or display room, this is an absolute peach! Not only does the scale dominate any area you choose to present him in, but the fantastic attention to detail, paint and costuming are all at the pinnacle of what can be achieved… and all for penny under 600 bucks. The accessories also give you the option of changing your display with three options. Of course I’ll let you decide if you think that is fun or not! This statue comes in at $ 599, which lets admit on face value does sound like a lot of money (heck, it is a lot of money). However, I still find this to be pretty good deal, and here’s for why! 1- Although it’s not our job as collectors to cut a company any slack, a new kid on the block is facing a far bigger uphill struggle than a well-established company. So the habit of cutting corners, just to get your product out there is not uncommon… I’m happy to report no cutting corners here! 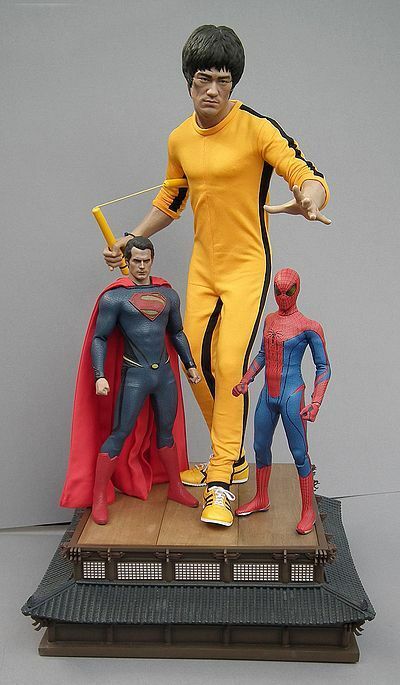 2- This is a frickin 1/3 statue for $599… hell even Sideshow routinely charge $300 for a ‘Premium Scale Statue’ which actually means � scale, and that extra 200 bucks buys you a far more dominant presence, and a paint app that is off the scale! 3- For the price you pay you are actually getting something that feels like value for money, and these days, that can be quite a rarity! 4- Blitzway + Bruce Lee + Arnie Kim… ARNIE KIM! Say no more! The witness for the defence rests your honour! But… and there always has to be a but, do check out your best shipping options, this thing is a beast, so get the best deal you can in getting it to you! I can find literally nothing to judge too harshly here, maybe the magnet that holds the right arm in place could have been a little stronger on mine, but to be fair it does the job assigned to it just fine, and if I was to set my mind on a particular display option, a tiny blob of the ever faithful ‘Blu-Tack’ will take away any worries of appendages falling off when you move it. 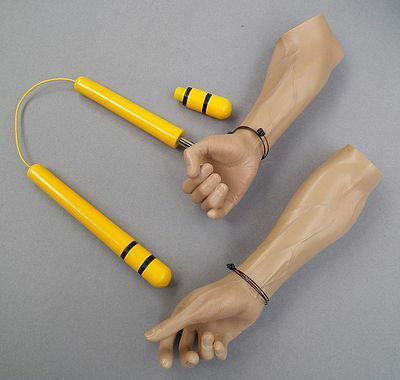 But to be fair I’ll be going for the nunchaku under arm pose, so problem there! 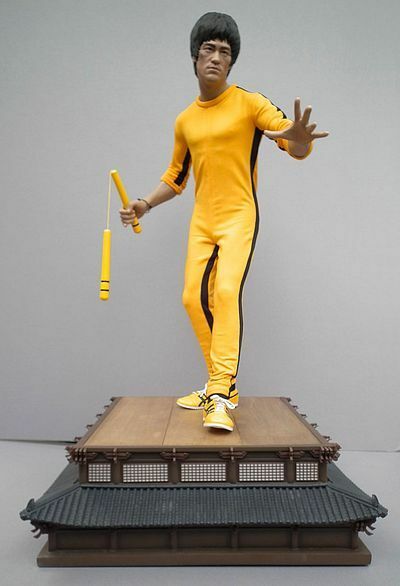 In short, as of this moment, this is THE Bruce Lee statue to own. 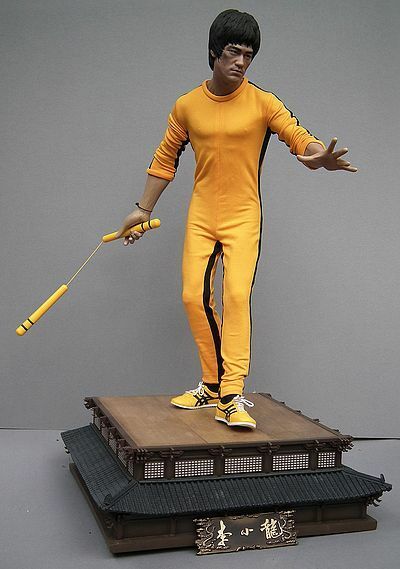 There has been (as I alluded to earlier) no shortage of very well put together figures of this iconic actor and renowned martial artist over the last few years, but none have the impact that this guy does. So until I can locate a more suitable home for him, mine is at present displayed in our front room (I have a very understanding wife), and it goes without saying that you literally can’t fail to notice him! Every detail has been sublimely rendered, and its obvious that with the carefully selected and diverse choice of materials chosen by Blitzway and Arnie Kim, that what we have is in their minds the best way to bring this figure to life, and you wont find me challenging them, as it sure beats one big solid badly painted chunk of Polystone. I have always been a dedicated onesixer, with occasional dalliances into the arenas of different scales and levels of articulation. But the one thing that has routinely kept me away from the world of statues and large-scale mixed media offerings is the lack of quality in the paint apps. Of course I realise it is horses for courses, but why would I want a figure that is much bigger than the usual 1/6th I collect, if the paint app is no where near the quality, and often embarrassingly bad? A couple of years ago Enterbay proved that we don’t need to accept these levels of quality on their � scale statues (http://www.mwctoys.com/REVIEW_100610b.htm ), and both they and Hot Toys continue to show the levels of realism achievable on their articulated figures… and now Blitzway show that even at this mighty 1/3rd scale, we need make no compromises in the quality of paint. 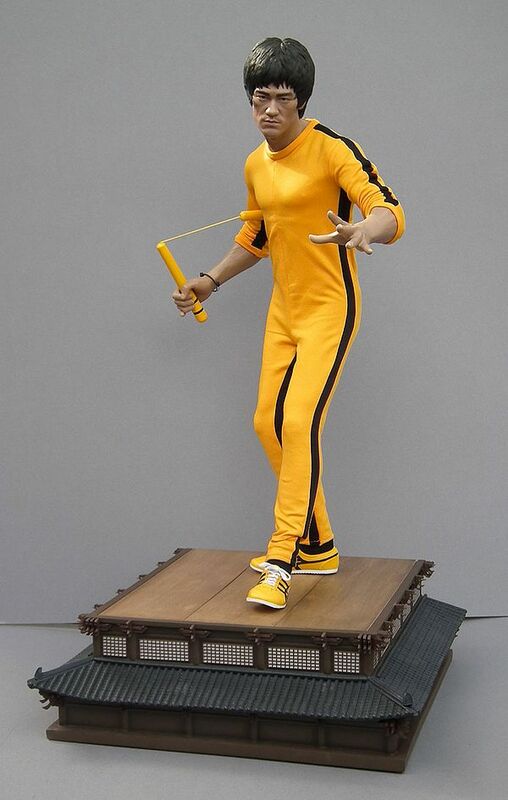 Add into this equation that we have another stunning portrait from Arnie Kim, a beautifully tailored outfit and probably one of the most impressive bases ever to accompany a Bruce Lee statue… all for just a gnats whisker under $600… colour me impressed. Of course its mighty scale, and subsequent hefty international shipping costs might be the thing that makes fewer of these end up in Europe, the UK and the US, certainly not enough to meet the demand, but with a growing part of the Chinese populace having more and more wealth, not to mention the likes of already fiscally buoyant nations like Singapore, I have a feeling this will sell well enough domestically to the Asian markets that it becomes a moot point! However, it does mean these might be thinner on the ground than people expect, so I wouldn’t delay jumping for too long. The best way to support the company is to purchase direct here from Blitzway. Or you can try our site sponsor Big Bad Toy Store that has it for a very reasonable $579.99. This product was provided for the review by the manufacturer. Photos and text by Jeff Parker.